Why are Condensing Water Heaters more efficient? Condensing Water Heaters operate at around 95% efficiency, compared with 80-85% for standard water heaters. This is achieved by condensing the water vapour in the flue gasses and returning that heat back into the return water going into the water heater. The flue stack temperature is considerably reduced and the return water temperature raised. Hence the term ‘Condensing Water Heater’. The extra efficiency is mainly due to the energy recovered from the condensation of the water vapour in the flue gases. This releases the latent heat of vaporisation of the water. Condensing Water Heaters require Stainless Steel flues to prevent corrosion. Due to the condensation of the flue gases, a condensate neutraliser is required before piping condensate to the drain. Plastic piping must be used for the condensate drain to prevent corrosion. 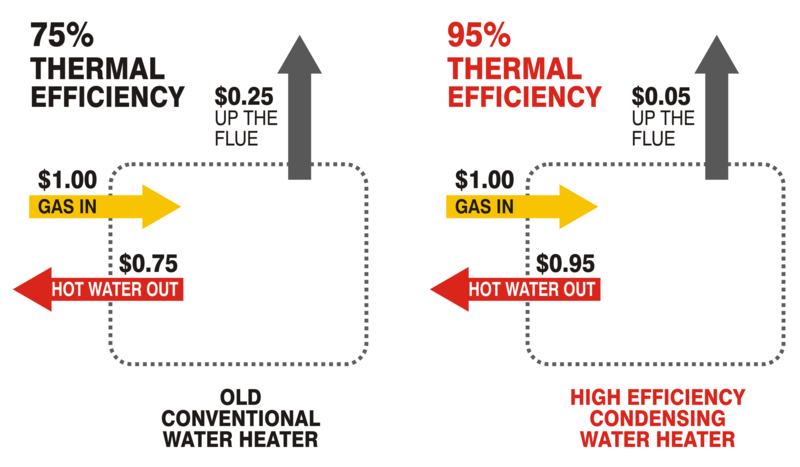 The above diagram illustrates the superior financial and environmental benefits achieved by Condensing Water Heaters over Conventional Water Heaters. 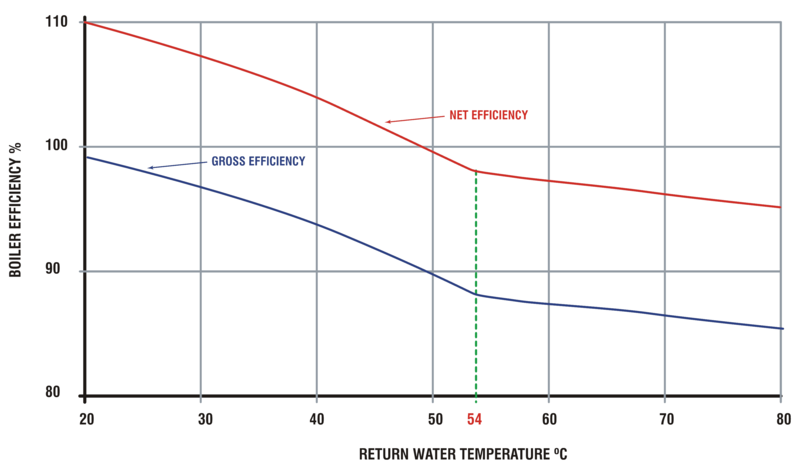 The above graph shows the increase of efficiency achieved when return water temperatures are below 54 degrees Celsius. Effectively what this means is that the lower the return water temperatures, the greater the boiler efficiency. Gas condensing water heaters are an ideal choice when you want a highly efficient heating system. They achieve a high thermal efficiency by using waste heat to pre-heat the cold water entering the boiler. Our high quality gas fired water heaters deliver consistent warmth without the noise and draft related with forced air systems. At Automatic Heating we aim to provide clients all over Australia with top quality gas condensing stainless steel water heaters and many other products that are energy efficient and can be fully integrated into an overall intelligent heating solution. Condensing Water Heater or Condensing Boiler? Condensing Water Heaters are also referred to as Condensing Boilers. In most water-based heating systems, the water is heated and circulated at a temperature of around 60 degrees. This is in contrast to a boiler used in an industrial process application where the water may be heated to produce steam. Because water heaters used for space heating purposes do not heat the water to boiling point, they are not subject to the same regulations and controls that are necessary for boilers that are designed to produce boiling water or steam.